Human skills are the main driver that enables producing high added value products in Europe. Thus the manufacturing processes are based on utilizing these skills. 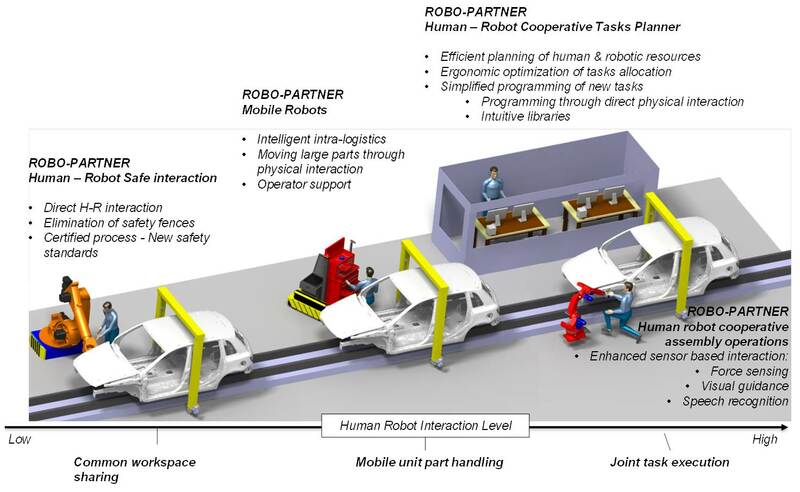 ROBO-PARTNER aspires the integration of the latest industrial automation systems for assembly operations in combination with human capabilities, combining robot strength, velocity, predictability, repeatability and precision with human intelligence and skills. Thus, a hybrid solution involving the safe cooperation of operators with autonomous and adapting robotic systems through a user-friendly interaction is proposed. - Development of more flexible integration and communication architecture by utilizing a distributed computing model and ontology services. The project will be based on industrial applications, bringing its development to a maturity level that will allow the introduction in industry, as well proven production technologies. One demonstration in automotive will involve the assembly of a vehicle's rear axle by robots in cooperation and workspace sharing with humans. A second demonstration will focus on the handling of large parts and the last one will deal with the white goods industry for refrigerators assembly.